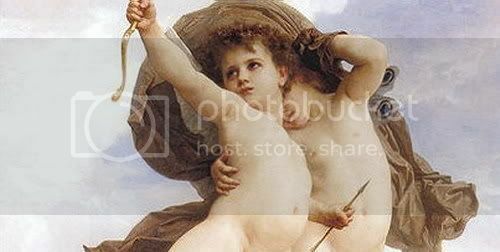 ~ detail from Bouguereau's "Victorious Love"
Early tomorrow I'll be flying off for an extended visit to family "out East". I'll be back at the end of January. At my mother's pre-computer home, I won't have any email or internet (*gasp and sob*), but I hope to catch up on things when I return. In the meantime, I wish you all very well! Thanks, Honey. I left a report on what I did in the previous entry, just in case anyone else wanted to have a go. You could do a "shoes" motif! May you have a good trip and a pleasant stay, Mech. Thank you, Estelanui. When I get back, I might not have time to scroll two weeks of entries. If you have done another art/reflection post, could you post a note to me so that I don't miss it? Thanks! May your visit be warm and wonderful and all your travels easy! See you in February! Thanks, Notabluemaia. I hope to follow your example when I return, trying to focus on better health habits. Thanks, Hadara, and I hope things go more smoothly again at work. Have a most enjoyable time with your family, Mechtild! Thanks, Whiteling! If I miss a cool manip or art piece in your LJ, please post a comment in here to let me know. I may not be able to get through that many days of f-list just back-scrolling. I didn't the last time, and I missed some good things that way (by not checking). No computer for two weeks? I'd have withdrawal symptoms! BTW, your new layout is gorgeous! Yeah, I go nuts without a computer the first few days. After day 4 or 5 acceptance sets in and I vacillate between, "Ah, free at last!" lightness and "This is so FRUSTRATING AND BORING" fits. Thanks, on the LJ lay-out. Did you see the previous post? There are remarks about how to do a little customizing if you need a lot of guidance (like me). Thanks, Mews. I hope your aches and pains don't act up too much during the rest of this cold period. Stay warm! Oh, Alchemilla! What a darling Curious George. Is it from an actual book? I don't think I've seen one where he's an angel. Oh, and thanks for the good wishes. I HATE catching up. That's why I was so thrilled to see you updated your "Frodo's Journey" today, the last day with computer. Now I know I won't have missed it. It was a super episode, too. Thanks, Maeglian. My mom sounds pretty o.k. on the phone, considering. She's very creaky and has painful joints, but even with that little stroke she's still lively. She just has troubles finding the right word for things - something I do all the time! My sister will be there, too. (My brother already lives in that area.) She made her trip from California now so that we could have a five-day overlap at my mother's. It will be like a little reunion! Have a nice and safe trip, dear. I'll be missing you! Enjoy your break with your family. I hope your Mum's keeping well. Yep, see you then, Maewyn. Maybe by the time I return there will be meteor showers over Perth. If so, I expect to see the photographs! I wished you a safe journey over at KD but thought you might not see it so I'm doing it here too. I hope you have a wonderful time with your family. I love the new layout. Is the background a William Morris design? I just saw your note, Brummie. I am not leaving until before dawn in the morning. Thanks for the good wishes! Yes, it is William Morris. I thought it looked Shire-ish. Well, not "Shire-ish" in the sense of the homes of the poorer hobbits, but of better-off ones like Bilbo. Look at the previous entry and you can read all about it. I have a link to a good site for William Morris wallpapers and fabrics for drapes and uphostery. I linked the site where I got the antique tile, too. and I love your new layout!! Thank you! Both about the trip and about the layout - that's great to hear coming from an artist!